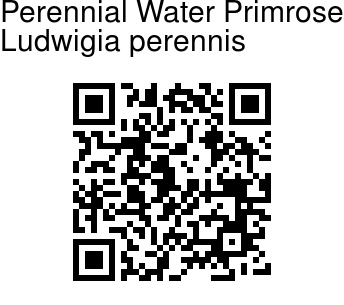 Perennial Water Primrose is an erect herbs. Leaves 2-6 x 0.5-15 cm, elliptic-lanceolate, base narrowed, tip pointed to long-pointed, hairless. Flowers are stalkless, yellow, 4-merous. Sepal tube is adnate to ovary, sepals lobes 4, about 2 mm long, ovate long-pointed. Petals are 4-5 mm long, elliptic, yellow. Stamens are 4, filaments short. Ovary is 1-1.5 cm long, linear, 4-celled, 4-angled. Ovules are many. Capsule is 1-2 cm long, linear, subterete, 4-ribbed. Seeds ellipsoid. Perennial Water Primrose is found in waterlogged areas in grasslands. The plant is found throughout the tropical world. 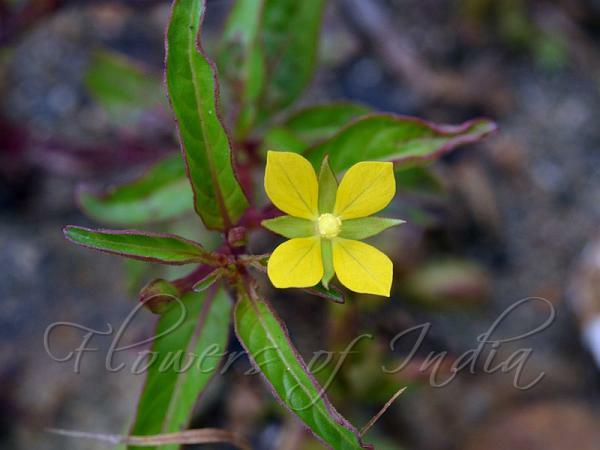 It is also found in the Himalayas at altitudes of 200-1400 m.
Medicinal uses: Tender shoot is rubbed on aching gums. Plant is boiled in oil which is applied to body to bring down fever. Identification credit: Neil Soares Photographed in Bangalore, Chhattisgarh & Imphal.